Ah, April. The showers. The flowers. And, of course, the state testing (aka the reason that absolutely none of us went into education). As an instructional coach, I am happy to support state testing, so that our kids have the best possible chance to show all that they are learning. . . but it is not the part of my job that fills my heart with joy. It can be easy to fall into a month of complaining: the stress, the lost instructional time, the unpredictability of falling out of our routines. We can find camaraderie in this coping strategy, but I would argue that it isn’t very productive, and it doesn’t actually impact the experience of adults or kids in a positive way. Here’s my trick for not losing my mind in April (and my recommendation to others). During testing season, I make sure that there is at least one slice of my day that reminds me why I really do this work. Every day, no matter what. 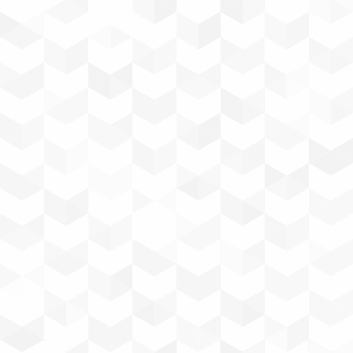 I schedule it, because if I don’t schedule it, it’s too easy for the day to fill up with other, less impactful work. So while the reality is that I’ll spend my mornings in April supporting state testing in 3rd-5th grade classrooms, I make sure to have in-classroom coaching cycle work going on in the afternoons. I need to be conferring with first grade readers, supporting a kindergarten teacher as she looks to challenge kids in math workshop, co-teaching a fairy tale writing unit in third grade. . . This work in the afternoons will keep me sane and centered, so that I can be the calm, patient problem-solver—available at a moment’s notice to handle whatever comes our way (with a smile)—in the mornings. So consider: What is that slice of the day for you? What is the part of your instructional day that lights up your core as an educator? Perhaps it’s read aloud, student book clubs, or writer’s workshop. Think about the piece of the day you (and your kids) would miss most if you didn’t have time for it. Once you identify your slice, REVEL in planning this part of the day across the month of April. Choose a new read aloud book that you can’t wait to hear kids talking about. Experiment with an unexpected genre in your book clubs (perhaps sci fi/fantasy or graphic novels—something you just know will fascinate kids). Explore an authentic form of writing that you can genuinely dig into side by side with your writers. Delight in placing this slice within each school day—even if the testing schedule affects when that might be. Make it non-negotiable. Be transparent with kids about how important this slice of the day will be for everyone this month. Think of this routine as a little gift packaged into every day. Testing isn’t just stressful on the adults in the building (obviously). Our kids are stressed, too. They look to us as emotion regulators in our learning communities, and if we allow testing to consume us, it will consume them as well. Schedule the joy, and keep the focus where it should be: on positive energy for learning. Making space in each day for the kind of teaching and learning work we value most will keep the energy high across the month—which can only have a positive impact on kids’ abilities to demonstrate what they are learning on these state tests. 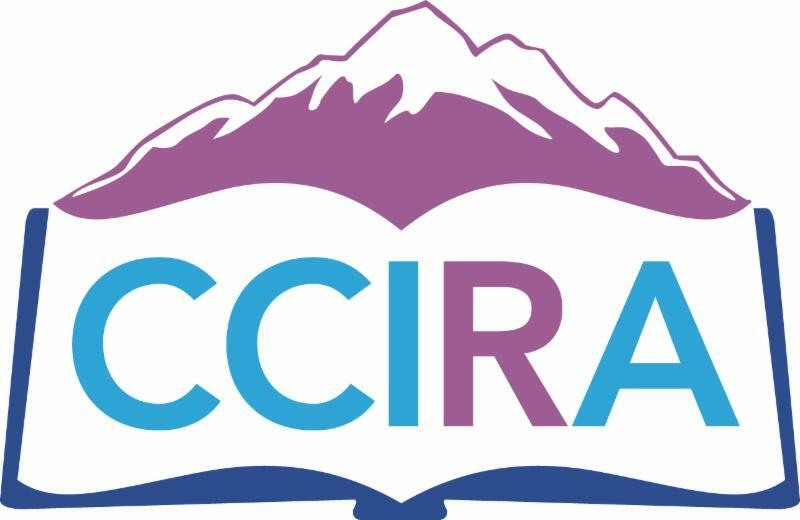 Plans are underway for the 2020 CCIRA Conference on Literacy! We will soon be accepting presentation proposals for speakers and authors for February 5th-8th. Check out our website and look under the "Conference" tab. Mark your calendars now for another amazing conference that is sure to share innovation at its best! The Johnstown Milliken Council of CCIRA held a local event on March 7 with Amy Nicholl from the Poudre Learning Center. Amy talked about inquiry and curiosity in the classroom. On April 4 the council will host Speed Dating With Books at High Hops Brewery in Windsor. 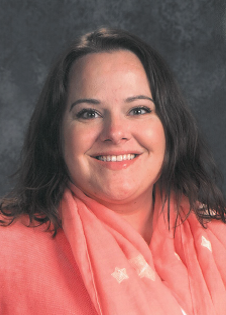 On May 2 author Jennifer Dizmang is coming to talk about teacher motivation. The council officers met with the Johnstown Milliken Rotary Club on March 28 and talked to them about the new council. As a result of the meeting they now have plans to partner with the Rotary Club for projects such as reading at the local Bedtime Stories event and building free little libraries for their community. 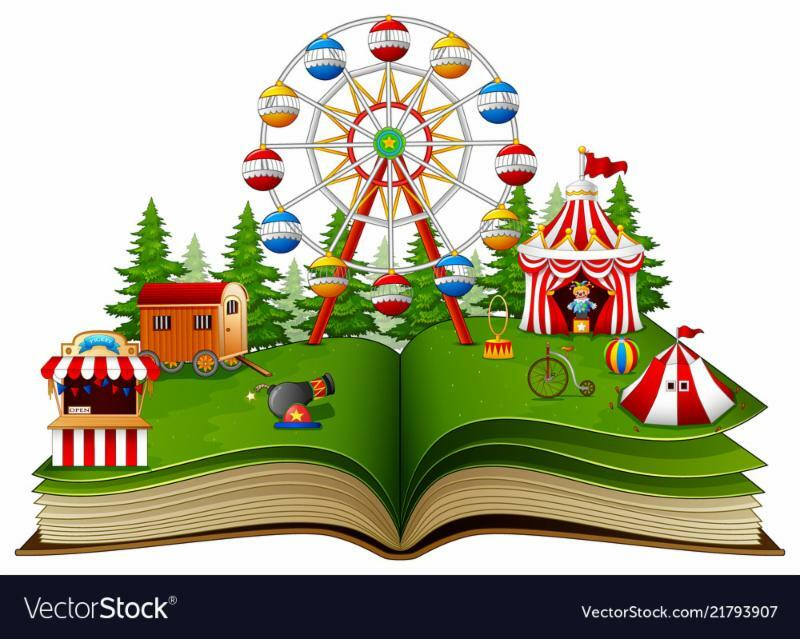 The Sagebrush Council will hold their annual literacy carnival on April 23rd. It is a collaboration between the 3 elementary schools and community groups to promote literacy. The Zoom In Inquiry Activity is a simple yet effective primary source strategy that can be used with virtually any primary source. It utilizes a PowerPoint and/or Google Slides cropping trick to break primary sources up into more easily digestible parts. By analyzing the parts before the whole, students are inspired by their natural curiosity. The power of this activity rests in the ability to crop out sections of the image or document to guide student’s learning. As sections of the primary source are revealed, students discover new observations, reflections, and questions through their own inquiry process, acting as detectives for their own learning. Tips: If you’re using an image, crop out everything but one side to give students a hint. For example, this Zoom In uses a photograph from the Denver Public Library of Buffalo Bill Cody alongside a group of Native Americans. If you want to use text, consider cropping out everything but the end so that students can figure out what came before it. Click here to view the full instructions. Ever use comics in your classroom? Comics are a great way to introduce fun and engaging literacy activities to all grade levels and skills. Plus, there is an amazing resource that both educators and students alike can take advantage of both in-person and online! 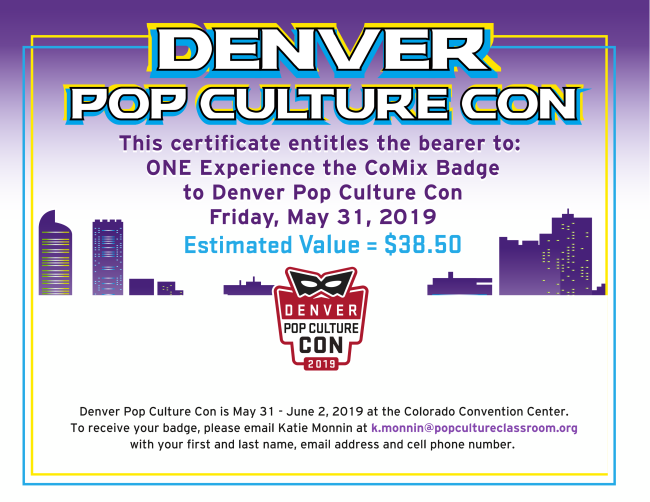 Pop Culture Classroom (PCC), which hosts Denver Pop Culture Con (f.k.a Denver Comic-Con) in downtown Denver from May 31 - June 2, 2019, has a wealth of literacy activities and resources for free for educators. From comics, gaming, and cosplay workshops to attending Educator’s Day on the Friday of Denver Pop Culture Con, their resources are both innovative and free! Integrating primary sources into their literacy activities and teaching guides on their site is a great way to ensure cross-curriculum standards are met, and allow students to play to their strengths. Recently, TPS collaborated with PCC at History Colorado and did just that. One of the most powerful activities teachers engaged in was to create a comic character based off of an exhibit at History Colorado. It combined primary source analysis, visual and textual literacies, storytelling, and pop culture literacies all into one. The best part? Primary sources were used as inspiration for the comic character’s background, super powers, origin story, whatever, giving students reason and purpose for connecting history with today. Visit CCIRA.org t o look over the array of grants and awards CCIRA offers. Begin to think about applying for a grant or nominating a deserving educator for an award to be presented in the Spring of 2019, and again in the Fall of 2019! Is your local council, state committee, school, or community doing something extraordinary for literacy in Colorado? Do you have a great idea to share with other educators on how to enhance literacy in the classroom? 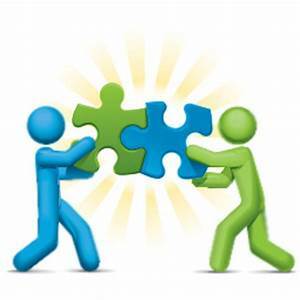 Do you know of a conference or event that CCIRA members might be interested in attending? If so, please contact Anne Cook to submit information for publication.